On university campuses around the world, “free speech” is becoming the favourite slogan of the right, sure to be raised during campus political controversies. The Spectator, a magazine whose political allegiance sits somewhere between Tony Abbott and Richard Spencer, writes of a “free speech crisis gripping the higher education sector across the Anglosphere”. An annual Free Speech Audit, published by the Liberal Party-affiliated think tank the Institute for Public Affairs (IPA), warns of an encroaching politically correct totalitarianism, stifling independent thought, debate and argument on campus. As with so many talking points of the Australian right, the narrative has been imported from the United States, where the question has become sharply posed after controversial campus speeches, protests and counter-protests in the last three years. And, as in the U.S., the threat to free speech on university campuses is a marketing tool for authoritarian right wing commentators. Consider the case of Ann Coulter, who has long advocated persecuting dissidents and restricting civil liberties. She even wrote a book praising Joe McCarthy. Summing up her views, she said in 2012: “Patriot Act – fantastic! Gitmo – fantastic! Waterboarding, not bad – though torture would have been better”. Yet this modern McCarthyite, who praises brutal forms of state oppression, indefinite detention and the policing of political activism, became an unlikely civil liberties martyr in 2017. A scheduled appearance by Coulter at University of California, Berkeley was cancelled by the administration to avoid on-campus protests. “It’s a sad day for free speech”, Coulter complained to the New York Times. Republicans sued to overturn the university’s decision. For some on the left, the association of “free speech” with right wing politics is already so deeply established that any claims of purported campus censorship are greeted with a reflexive eye-roll on the assumption that it is only a cover for right wing race-baiting, misogyny and authoritarianism – as it often is. But it was not always so. 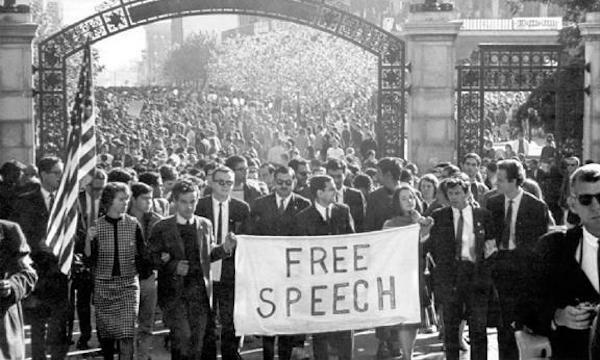 The student left can trace many of its modern traditions and institutions to the Berkeley “Free Speech Movement” in the 1960s, when leftist students fought for the right to engage in anti-racist activism on the campus, in defiance of restrictive university rules. In the eyes of many, the roles have now been reversed – hence the right’s focus on the Berkeley campus. The campus left is labelled censorious, at once infantile and authoritarian, trying to turn every university into a giant “safe space” where troublesome opinions are banned. In this narrative, the right are the public champions of free speech, free thought and free political association at universities. There are real battles happening over freedom of speech on university campuses. Both students and staff members are at risk of censure, sacking, suspension or expulsion for taking controversial public stands. But the battle lines are drawn differently from what the right wing publicists, who have the media’s ear, would have you believe. Increasingly, university administrations and their right wing enablers are cracking down on leftist activism and dissent. University campuses are unique, vital organising centres for political advocacy. This is even more the case in a period when leftist ideas are largely excluded from mainstream politics. So the campus left needs a clear and consistent approach to the question of free speech and its defence. What do we mean by threats to free speech? Let’s start by excluding trivial matters: if a controversial opinion is expressed, one can expect disapproving looks or comments, public rebuttals or personal remonstrations. Public protests and heckling are not in themselves threats to free speech. They are exercises of free speech and the basic democratic right to express an opinion. Argument, protest and counter-protest are routine behaviours in a contested political environment. But powerful institutions wish to restrict the range of opinions expressed at university campuses, and there are ways to do it. Academic departments can be de-funded or destroyed wholesale, either by university management or by government policy tying funding to political objectives – such as producing research profitable for the private sector. Academics and staff members can be dismissed from their jobs, or subjected to stringent conditions preventing them from expressing their political opinions. Student organisations can be dissolved, or absorbed into the administrative structures of the university to rob them of any independence. The promotion of political ideas on campus – with posters or leaflets, say – can be banned under university regulations. Students and staff can be banned from independently booking meeting rooms, or charged impossible fees. Political argument can be re-defined as bullying, and individual activists can be targeted for suspension and even expulsion. These disciplinary methods are now an accepted part of campus life. When combined, as they are at certain campuses, the slightest attempt to express political opinion without university management approval can result in hefty fines, sacking or exclusion from the campus. Some of the more egregious examples from recent years include the dismissal of La Trobe academic Roz Ward after she expressed a left wing opinion on her private social media account. There have been dissolutions of leftist political clubs and suspensions of left wing activists. In what might seem an ironic twist, but is par for the course, the charges are often filed by “free speech defending” conservative political operators. For example, the IPA’s campus free speech expert, Matthew Lesh, spearheaded the campaign to ban the socialist club at Monash University when he was a campus activist. Then there was the not-so-much talked about University of Wollongong unilateral decision to overturn the result of student union elections. Management decided it did not like that leftists had won in a landslide, so it simply installed a right winger instead. The justification? Leftist activists had campaigned noisily without gaining permission. The right to free speech is intimately connected to other democratic rights under threat on campuses. The left must defend the existence of independent student and staff organisations, conducting their internal elections and public political activities without restraint. Without a right to freely campaign for election, or use these bodies to campaign in society more broadly, those organisations are nothing more than an extension of management. The left must defend workers’ rights, including their right to job security, even if the ideas of academics don’t fit the priorities of the university’s marketing department. And we must defend the right to argue and protest without being punished or fined (or fined with an arbitrarily cooked-up “booking fee”). Free speech is facing real threats from the absorption of university civil life into a bureaucratic and corporate framework. For our own political survival, and because it underpins all the other democratic rights we hope to exercise, the left must resist all attempts by universities to limit and police political argument and expression. The conservative attitude is bedevilled by a fundamental contradiction: it says it’s for freedom, but is devoted to the most powerful and oppressive institutions in society, such as corporations and the capitalists who control them, the police and spy agencies, the “border security” apparatus and so on. All these institutions restrict free expression when it conflicts with their power. Conservative free speech advocates usually have a history of advocating for restrictions on speech and liberty when such freedoms conflict with the interests of the institutions that the conservatives hold dear. We see the fining or sacking of workers for doing on-the-job trade union organising; the advocating for management prerogative in all aspects of working life; the attempts to drive dissenters such as Roz Ward or Yassmin Abdel-Magied from public life; and the herding of foreign-born activists into detention centres, and then deporting them to secret overseas torture camps from which journalists are banned. The litany of extreme abuses of free speech endemic to Australian capitalism is endless, and the indifference from conservatives is deafening. Often, right wing activists’ constant invocation of “free speech” serves two purposes. First, downplaying the viciously anti-democratic ideas of the sometimes quasi-fascist figures they promote, who can present their advocacy of tyrannical right wing authoritarianism as a playful provocation and part of a campaign to introduce intriguing and unusual ideas into public life. Second, and most balefully, laying the basis for restraining the political rights of campus activists – because whenever they criticise, mock or protest a right winger, they are violating their “free speech”. Free speech here is redefined to mean only the speech of the right. When the left exercises free speech to criticise or protest the right, we are described as baying mobs of tyrants-in-waiting, bullies and abusers who should be restrained or disciplined. The corporate-funded IPA is one of very few institutions that claims to consistently defend unrestrained political debate in campus life. It now publishes annual reports listing universities’ encroachments on free speech and is frequently quoted in the press as an expert on the topic. But it, too, plays the game. The IPA is obsessed with trivialities like trigger warnings, but strangely uninterested in, for example, a guaranteed right of university staff to engage in political activism without being disciplined by management. And it also seeks to re-brand leftist speech as bullying, abuse and intimidation. When a misogynist film was screened at the University of Sydney, leftist students organised a protest, exercising their free speech – explicitly and repeatedly explaining that they did not want the screening cancelled. But the IPA listed this protest as a threat to campus free speech, one of the top five “worst actions” of 2017! When the right do it, it’s free speech – when the left do it, it is authoritarianism. Despite the successful re-branding exercise, conservative political groups are not consistent defenders of campus democracy. Leftist politics is about challenging institutional power, and asserting the rights of the oppressed through collective political organisation. It is about building collective confidence and self-belief, against the capitalist institutions that seek to encourage our sense of powerlessness. This means that only the left can consistently defend the right of free speech. But this requires a commitment to do so–even when free speech is so often seen as code for right wing provocation. The hypocrisy of right wing “free speech advocates” can encourage the left to downplay the very notion of freedom of speech. For some on the broader campus left–such as it still exists–freedom of speech is only a right wing catchphrase, to be dismissed without a second thought, or even to be opposed. As the non-socialist left has shrunk, given up on collective public organising and retreated to bureaucratic identity politics, its affinity with bureaucratic political methods has grown. It should be obvious that no “left” can rely on trigger warnings, safe spaces or “anti-bullying” codes, or call for university authorities – or even the state – to discipline what speech is permitted and what speech is denied on campus. These are individualistic, disciplinarian and conservative political methods inimical to the left’s requirement for open debate and political contest. If this culture is entrenched on campus, the left is weakened in its capacity to organise and fight. It only provides an intersectional coat of paint to the university’s existing desire to police the political conduct of its students and staff. In the current campus climate, most “grassroots” attempts to “shut down” or “no platform” right wing speakers have a similarly negative effect. Fifteen hoodie-clad activists blocking a doorway or storming a meeting do nothing to increase the confidence or organisation of the mass of staff and students – even if they force the cancellation of the event. For most spectators, the impact is the same as had the university cancelled it. Some will see the left as the authoritarians who, having lost the argument, resort to force to win the day. Some will be grateful that a right winger was defeated or humiliated. But none will be convinced that they should participate in political organising, or that they are part of some broader social force that must assert itself and, by so doing, impact the world in a positive way. We can’t accept the right’s claim that fascists are for free speech and leftists are for bureaucratic intimidation. The campus left must take a stand for unrestricted political activism: for free speech, free postering, free organising, free protest and counter-protest. We must resist the right’s attempt to smear all leftist speech as intimidation, but we can’t fall into the trap of dismissing free speech as a right wing red herring. Instead, we must recognise it as a vital necessity for progressive social change, a right largely denied to the working class and the oppressed and a right that we fight to defend and extend through collective resistance.